I could eat you up, little one. 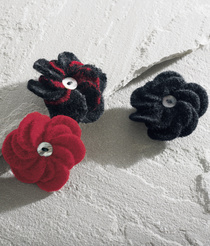 THE HOLE THING's new felted flower pins are now available in the Appleseed's Holiday 2010 catalog, online, and in Appleseed stores. THE HOLE THING is featured above on Daily Grommet. 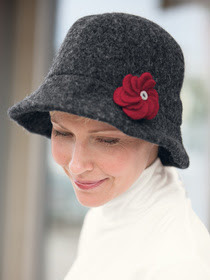 They came to my studio recently to learn more about my felted wool goodies and taped this video clip. THE HOLE THING'S garlands and necklaces and pins are available for purchase at the end of the video, or if you'd like you can go direct to Daily Grommet. 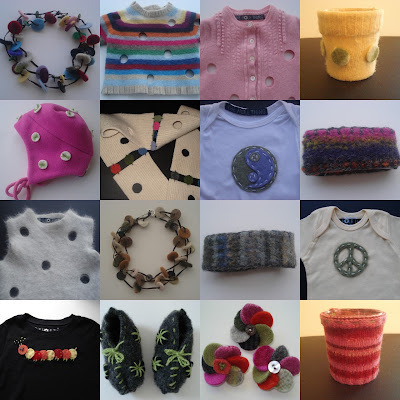 THE HOLE THING'S array of felted wool products are made solely from recycled sweaters. Many of them have die-cut holes in them which create windows for whatever is worn underneath. Kind of like polka-dots. We call them our swiss cheese sweaters. The leftover dots are then recycled, and appliqued onto other products. Ta-da! THE HOLE THING is featured in the Spring/Summer 2009 issue of Studios Magazine. THE HOLE THING may be purchased Here. 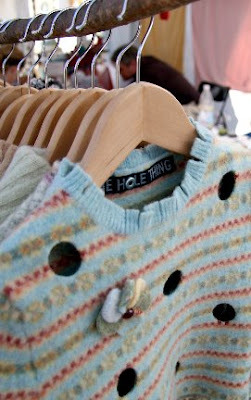 THE HOLE THING would love your vote for the Leading Moms In Business 2009 Competition. It ends March 31, 2009 and you can vote as much as once a day. It only takes a second I promise! Just click here. Thank you thank you! First of all invest in some grocery bags that you can use over and over again. I bought 6 of these big ones from Ikea for .99 cents each and I love them. I cannot tell you how much easier it is to carry them into the house as opposed to all those plastic or paper bags (that the average household uses more than a thousand of a YEAR). You can even carry them on your shoulder like a beach bag. Rethink your week: In an effort to save gas try to combine grocery shopping with other errands such as going to the bank, the cleaners,the liquor store,to get gas, or the library etc. Shop once a week ( I know, I know..) but you won't believe how much this will simplify your life buying dinner for all 7 nights. Five minutes of planning can go a very long way. No more wondering at 5:00 PM what the heck you are going to have. Start by making a master list on your computer of everything you like to cook. Put your list into simple categories such as pasta dishes, salads, soups, seafood, meat dishes, chicken, etc. Print the list out and put it in the car for reference. Before I shop I make a grocery list and on the side of the list I write the numbers 1-7 ( or fewer numbers if you know you already have plans for dinner out on certain nights). Next to each number I write down a dinner idea. This is never set in gold as you can move dinners around to suit the day and your own personal cravings. If you have a family or roommates it is especially helpful to ask them if they are having a yearning for anything in particular to give you menu ideas. I know this all probably sounds extreme but you won't believe how great it is to have the shopping and planning done all in just over an hour. This saves on gas guzzling repeat trips to the grocery store but also on take-out food- not to mention all the waste that take-out packaging creates. Buy in bulk. You've heard this before, but individual packaging truly creates a ton of waste. Shop off hours: Standing in rush hour/weekend traffic burns a lot of gas. If you can't shop during a weekday, shop after dinner if you can. Not only will you avoid traffic, you will also sail right through the grocery store. Ta da! Buy local, buy in season, support your local farmer's market. Be more conscious: I've been noticing how easy it is to use more than I actually need of household items such as toothpaste, shampoo & conditioner, dish soap, paper towels and even toilette paper etc. Now here is the biggest thing: Consuming red meat creates MORE of an environmental hazard than our fuel emissions do. What you ask? Can this be? Maybe you have heard this before- and it is true- check this out. Personally I am not at the point where I can give up red meat entirely without feeling very deprived. But there is something that we meat lovers can do- we can eat it less frequently. We can also eat less of it when we do eat it by using smaller amounts in our cooking. We don't need to use a pound of meat when we make lasagna- we just need to flavor it-so trying using half of what a recipe calls for. Also join me on the national trend of Meatless Mondays. Here is my last tip: When you buy pre-packed packages of food- whether it is chicken, or cheese or snow peas- choose the ones that weigh the least. This is a small effort that adds up. When you consume less there is less demand for the stores to stock more of it- and for the delivery trucks to deliver more of it to the store. Turns into a big energy saver in the long run I assure you. You also end up consuming less food this way which is helpful in the battle of the bulge, not to mention in lowering your grocery bill as well. I dedicate this post to my Mamacita. A domestic goddess born in 1922. Please feel free to comment with any tips of your own. The New England Flower Show, is the 3rd largest in America. The theme this year is Rhapsody in GREEN. 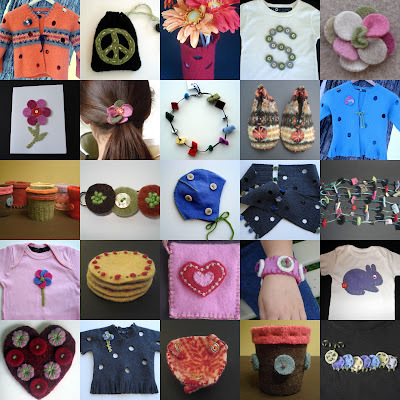 The Massachusetts Horticultural Society will have my whimsical felted wool sweaters and accessories available for sale at their booth. The show takes place at the Bayside Expo Center. Adult ticket prices are $20. Come have a breath of spring ! Last night I went to the opening party for Good Housekeeping's Green House at 151 West 122nd Street. The Green House is a four-story brownstone that is New York's greenest residential home. With interiors designed by Robin Wilson Home it features environmentally-friendly construction because of the type of lumber and cement that was used, but also, guess what the house was insulated with? Denim ! How neat is that? The sustainable home also featured energy efficient everything- from it's solar heating system, appliances, and point of use tankless water heaters, to the environmentally friendly paint used on the walls. But these were really the less interesting details of the home if you ask me. The furnishings were amazing as well. In an effort to use what is already available and not produce something new, many pieces in the house were vintage. 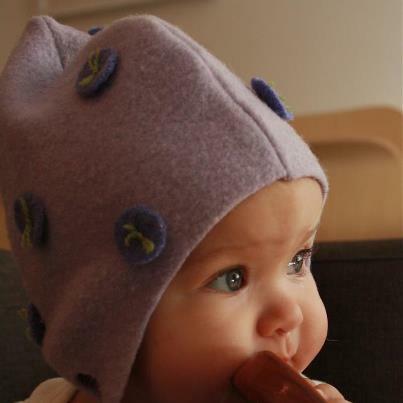 THE HOLE THING ® was the featured children's clothing line, as well as gorgeous tiles made of 100% recycled glass, rugs made of recycled nylon ( that can be recycled again), and furniture and linens that were all earth-friendly and wonderful. Robin Wilson Home really proved that eco-friendly is synonymous with beautiful. You can view a video of the house here. The home will also be showcased in Good Housekeeping's Your Good House magazine's November 2008 issue. This vase was designed by my niece who is just 10 years old. Isn't it neat? 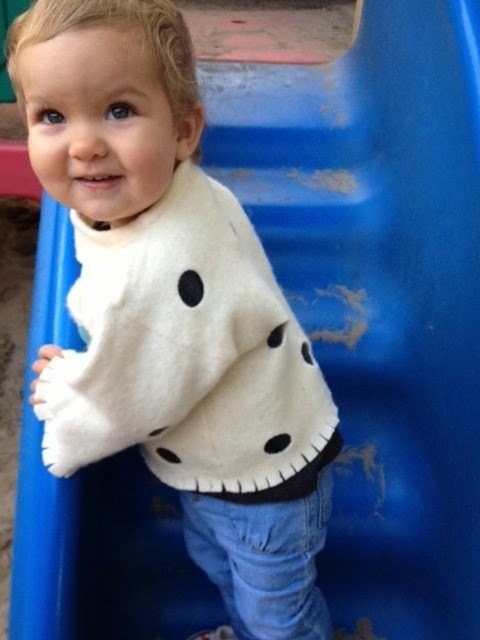 I gave her one of my hole sweaters awhile back. She preferred that it was a vest so we cut the sleeves off. Soon after she called to tell me that she had made a vase out of one of the sleeves. Makes me wonder what she'll be doing later in life. Can't wait to find out. 1. Recycle your old cell phone at Green Phone and earn as much as $35. 2. Carry it out when you shop and leave the bag behind. 3. CFL light bulbs use 75% less electricity and last 10 times longer. It's as simple as that. 4. Dust off your bike. 5. 401K: invest in environmentally conscious mutual funds. 6. Go meatless at least 3 times a week. 7. Let your grass grow a little longer. It will have a thicker turf and longer roots so you won't have to water it as much or use as much gas throughout the season to mow it. 8. Keep a chart of how many kilowatts of electricity you use each month. When the bill comes try and beat last months usage. Make it a game. 9. Buy a laptop. It uses much less electricity than a desk top. 10. Keep your car tires filled for better mileage. 11. Okay one more...Buy local, buy in season, support your local farm.